The 1 Gallon Cookie Jar Fish Bowl is a wonderful alternative to glass containers. 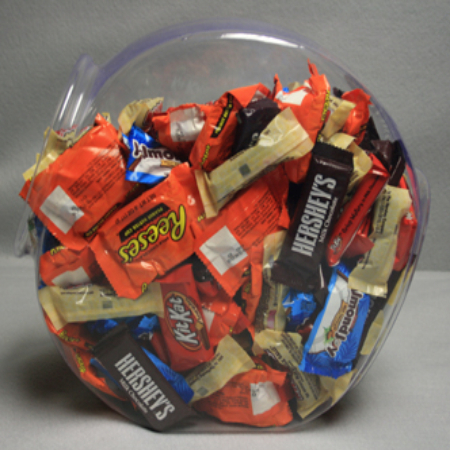 These plastic fishbowl style candy bins are much safer than the traditional glass jars. Adding the element of safety to your store encourages parents to bring their children back again and again. Set the clear fishbowl on the flat bottom and you have the perfect, pre-created opening angle for customers to reach in with their hands, scoops or tongs. Lined up on your shelves with a colorful mix of candies and other treats, you have one very visually appealing set up. Don't just limit these plastic bowls to candy or you will limit their wonderful versatility. Use these durable containers for a variety of products such as cookies, cosmetics, and other smaller items. Place a candy filled fishbowl at the checkout to increase impulse sales. When planning themed events which feature the beach or ocean you can make these the highlight of your event. Make fun centerpieces, a one-of-a-kind candy buffet featuring these displays. Place your order today. Purchased Cookie Jar Fish Bowls for a raffle related to business open house. Shipped and arrived in a few days. Better quality than expected. Heavier and very stable for collecting raffle slips. Great value for the price. More than met our needs. Great service. Very good experience ordering from your company. We received the items very quickly and loved them. We definitely will use your website in the future and will refer to others as well! Easy to use web site. Product exactly as described. Very fast fulfillment. Strong customer service - quickly responded and answered questions. Easy order Quick delivery Helpful customer service GREAT Experience!